it offers resistance to the flow of current. The two main characteristics of resistors are its Resistance (R) in ohm and Power rating (W) in watts. In electronic circuits, the resistors with higher 'R' values have lower wattage rating because they have less current. All electrical devices that consume energy must have a resistor (also called a resistance) in their circuit model. Inductors and capacitors may store energy but over time return that energy to the source or to another circuit element. Power in the resistor, given by p = vi = i2R = v 2/R, is always positive as illustrated. 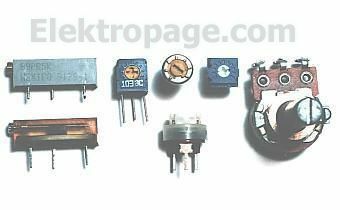 Special components called resistors are made for the express purpose of creating a precise quantity of resistance for insertion into a circuit. Theyare typically constructed of metal wire or carbon, and engineered to maintain a stable resistance value over a wide range of environmental conditions. Unlike lamps, they do not produce light, but they do produce heat as electric power is dissipated by them in a working circuit. Typically, though, the purpose of a resistor is not to produce usable heat, but simply to provide a precise quantity of electrical resistance. This is resistor "R1" with a resistance value of 150 ohms. This is resistor "R2" with a resistance value of 25 ohms. 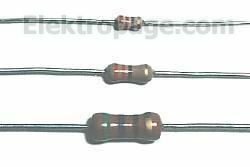 Resistors can also be shown to have varying rather than fixed resistances. This might be for the purpose of describing an actual physical device designed for the purpose of providing an adjustable resistance, or it could be to show some component that just happens to have an unstable resistance.